Quest announced a few things today. "DENVER--(BUSINESS WIRE)--Qwest Communications International Inc. (NYSE:Q - News), today announced that it is offering $500 million aggregate principal amount of debt securities in a private placement to be conducted pursuant to Rule 144A under the Securities Act of 1933, as amended. The net proceeds of the offering will be used for general corporate purposes, including repayment of indebtedness, and funding and refinancing investments in the company’s and its subsidiaries’ telecommunications assets." 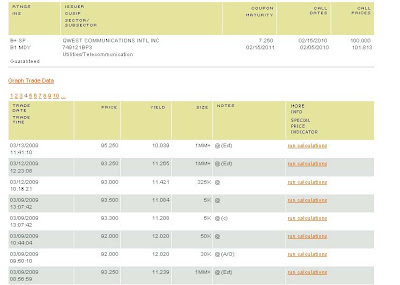 "In addition, Qwest Communications International Inc. (QCII) will redeem its 7.25 percent senior notes due Feb. 15, 2011, at a price of 100 percent. The $525 million outstanding principal amount and accrued interest payment will be payable on Feb. 16, 2010." "On January 6, 2010, Qwest Communications International Inc. (“Qwest” or the “Company” or “we” or “us” or “our”) updated its full-year guidance for 2009. Qwest expects that its full-year EBITDA will be near the upper end of its guidance of $4.25 billion to $4.4 billion. Qwest also expects that its full-year adjusted free cash flow will exceed the upper end of its guidance of $1.6 billion to $1.7 billion. Finally, Qwest continues to expect that full-year capital expenditures will be $1.6 billion or less." Note any problems? I do. They kept EBITDA estimates and Capital Expenditure estimates the same, while increasing Free Cash Flow. Generally, that can only be done through working capital actions - pushing off payments to suppliers or speeding up collections from customers. Both increase cash flow, but they're limited in scope and cannot be considered repeatable long-term drivers of cash flow. So at a more (maybe unreasonably) conservative $1.3billion in 2010 Free Cash Flow, that's a Free Cash Flow Yield (FCFY) of 16% on the company's market cap. With cost of capital at 7%, the stock probably does not need such a high FCFY%, and should trade higher. What's more, one could technically buy the company for $8billion and pocket the company's $2billion in cash -->> now we're talking about a $6billion purchase with Free Cash Flow of $1.3billion...a FCFY% of 22%. Why net out cash when I don't add in debt? Because they cover quarterly interest payments 6 times over, a very healthy margin in this sector. And again, I'm being VERY conservative in my Free Cash Flow estimate. This is one of those situations where the company has issues, but the yield is simply too great for me to ignore. Just bought shares, as I expect Qwest to rise significantly.